getting free silver so easily for absolutely free of cost. Register a free account . That'sit,you'vegot 1 gram free silver. To redeem free silver,you need to refer at least 9 more friends because minimum redemption is 10 gram silver. Refer following article to know how to refer and earn more silver. Click and generate your refer link. Now you'll get your refer link in registered mobile number by a text message instant. 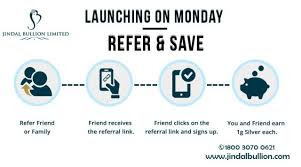 Share that refer link with your friends. Per refer you get 1 gram silver while your friend get 1 gram silver as well. This is a Win-Win situation, so it is more easy to convince your friends now. You can redeem unlimited friends. Minimum redemption is 10 gram.